Camera (Take a snapshot) is back! In schools, users must be 13+ or a Teacher can lead. What can you do with Google Hangouts? Whole group call? Break into smaller groups? Pairs? Individuals? Time zone … go north/south to avoid large time zone shifts. 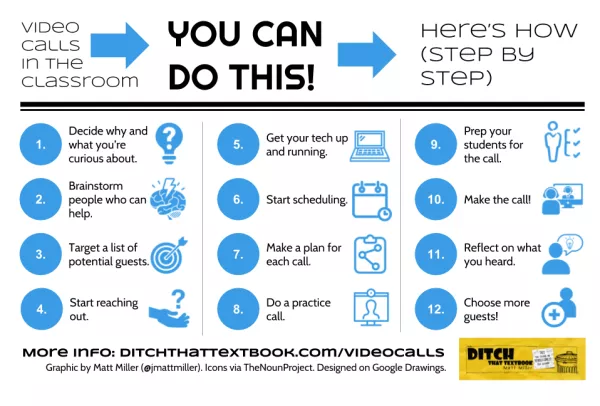 Do a practice call ahead of time to check audio/video. Let student passion/curiosity rule whenever possible! Student-led video calls are often the best experience for everyone (even if it feels like chaos or like you don’t have control). Classroom video calls. You can do this. Here’s how. In honor of our 1-year anniversary, we'd like to turn the podcast (episode 39) over to you! Leave us a message with your best Google tips, tricks, and ideas! (2-minute max.) Don't forget your name and location, too. Libby Knaggs (Ingram, TX) - Used Page Marker extension and loved it! Jennifer Portilla (Longwood, FL) - How can I not show new students to Google Classroom all the previously posted content? Kasey - Student-Created Vision Boards with Google Slides AND a BIG announcement coming!